Green, non polluting toilet bowl power cleaning without compromise. 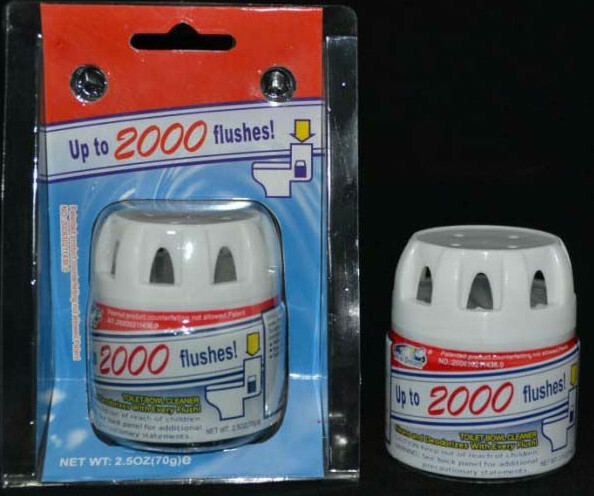 Blue Dream Up to 2000 Flushes is an amazing patent device which goes in your cistern and automatically treats your toilet for around 2000 flushes. You get dirt, limescale, uric acid stains, rust, smells, germs powerfully busted. Yet, the ingredients are natural, environmentally friendly and biodegradable. Try reading the back of a regular toilet cleanser packet. Blue Dream Up to 2000 Flushes Toilet Bowl Cleaner Cleans and deodorises with every flush. It is also a high tech patent product which cleans your toilet bowl automatically every flush yet is kind to the environment. 7cm x 5.75cm 2.75 x 2.25 inch, astonishingly lasts up to an amazing 2000 flushes. Suddenly hi tech and environmentally friendly comes to toilet bowl cleaning. Green In Cistern Toilet Cleaner text, images and video are copyright.